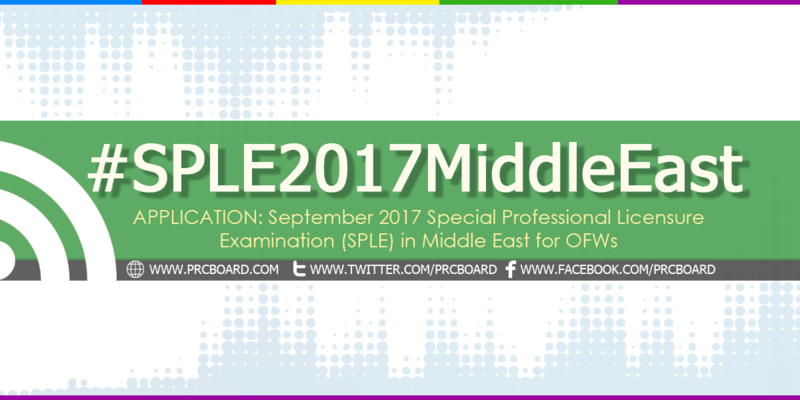 MANILA, Philippines - The Professional Regulation Commission (PRC) announced the application schedule of the Special Professional Licensure Examination (SPLE) formerly SPLBE for Middle Eastern countries for the year 2017. As posted, the September 2017 SPLE will be conducted on September 1-3, 2017 in testing locations at the following countries. Upon completion of online application, the applicant shall submit the photocopies of basic and specific requirements together with printed and signed application form at Philippine Overseas Labor Offices (POLO) on or before June 9, 2017 (deadline). The list of conditionally approved applicants will be posted at PRC official website which shall then be forwarded to the eight (8) testing locations. Meanwhile, below are PRC Resolutions Nos. 2017-1037 entitled "Fixing the dates and places of the Special Professional Licensure Examinations (SPLE) for Overseas Filipino Workers (OFWs) in the Middle East for 2017" and 2017-1038 entitled "Establishing the timetable of activities for the conduct of the Special Professional Licensure Examination (SPLE) for Overseas Filipino Workers (OFWs) in the Middle East for 2017" courtesy of PRC. PRCboard.com is among the trusted websites when it comes to providing timely and reliable information on any government-related examinations. Further updates about September 2017 SPLE board exam results and related news and announcements can be retrieved at this website or at our social media pages via Facebook and Twitter. It will appear and printable once they validated your payment from your online account. I cant finish the application online. There's no date of exam and location. There's also an error message saying that cedula must be on the same year. What should i do? Is there a uae hotline for prc? Thanks. how could I get the online account? when is the expected release of results for SPLBE? Please update for the next SPBLE for LET here in kuwait? I am very depressed that knowing there is an exam here in Kuwait.. Please update me when is the next & how can I? I am currently doing my architectural apprenticeship here in the Philippines, and I'm planning to finish the remaining number of hours in Dubai. Is it still valid that half of my apprenticeship hours will be accomplished here, and the other half in Dubai? Can we have the exam here in UAE for Industrial Engineers?